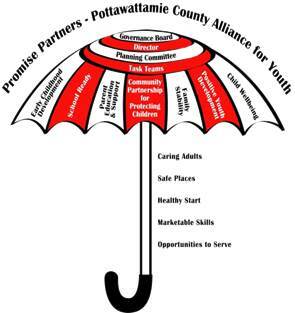 Promise Partners is an umbrella organization that oversees state and local initiatives in Pottawattamie County. By working together through interagency and cross-discipline collaboration we can better coordinate efforts to effectively address the needs of children and families. 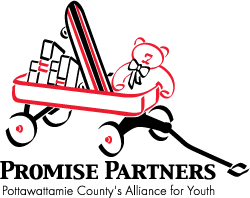 Our mission is to empower a caring community that promises the well-being of every child. CARING ADULTS: Every child and youth needs and deserves support and guidance from caring adults in their families, schools and communities, including ongoing, secure relationships with parents and other family adults, as well as multiple and consistent formal and informal positive relationships with teachers, mentors, coaches, youth volunteers and neighbors. SAFE PLACES WITH POSITIVE ACTIVITIES: Every child and youth needs and deserves to be physically and emotionally safe everywhere they are – from the actual places of families, schools, neighborhoods and communities to the virtual places of media – and to have an appropriate balance of structured, supervised activities and unstructured, unscheduled time. A HEALTHY START AND FUTURE: Every child and youth needs and deserves the healthy bodies, healthy minds and healthful habits and choices resulting from regularly health care and needed treatment, good nutrition and exercise, comprehensive knowledge and skills and role models of physical and psychological health. LIFE SKILLS THROUGH EFFECTIVE EDUCATION: Every child and youth needs and deserves the intellectual development, motivation, and personal, social-emotional and cultural skills needed for having quality learning environments, challenging expectations, and consistent formal and informal guidance and mentoring. OPPORTUNITIES TO SERVE, LEARN, & GIVE BACK TO THE COMMUNITY: Every child and youth needs and deserves the chance to make a difference – in their families, schools, communities, nations and world – through having models of caring behavior, awareness of the needs of others, a sense of personal responsibility to contribute to larger society, and opportunities for volunteering, leadership and service.